In last week's post, I shared how my challenges in juggling multiple calendars and planners resulted in confusion. After attending a class on organizing life events around your highest priorities, I was able to achieve a work-life balance that I have generally maintained. However, until recently, I still had two different books to help me stay on top of things. 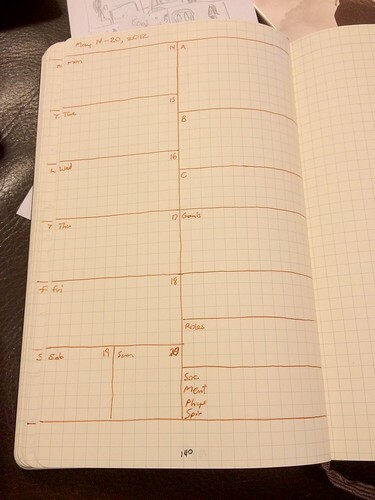 I used a FranklinCovey wire-bound planner for scheduling and tasks. For notes I used a Moleskine notebook. 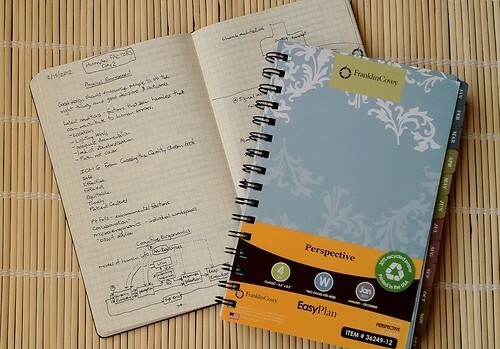 Just recently I came across a blog post that discussed using a notebook to create a planner. PlannerHack.com walks you through the steps to create a planner. There are also several articles and links that discuss the importance of paper-based planning. Years ago I was given a Palm Pilot for work. It contained my calendar, contacts, and tasks. Unfortunately, the battery died and I was unable to get it replaced. I lost everything! That's why I prefer paper. Even today, as I type this post on my iPad, I still believe in the role of paper. I have a copy of my master's thesis on a 3 1/2 inch floppy disk as a WordStar word processing document. I also have a copy of the same document printed in my library. Which one is instantly readable right now? Inspired by the articles on creating my own planner, I now have integrated my planner/calendar with my notebook. The result is that I have spaces for daily events and tasks along side with pages for notes. So far, I am happy to be carrying around one less book and still able to keep track of all the information I need. It does not take long to draw out the boxes for each week. Keeping track of events, tasks, and goals on one page is nice. Additionally there is room on the planning side of the page for some notes. The right page is blank to allow for notes. Read the articles at PlannerHack.com to see if creating your own planner is the right solution for you. To receive an e-mail when a new post is published (about once a week) please subscribe using the link at the top right of this page.